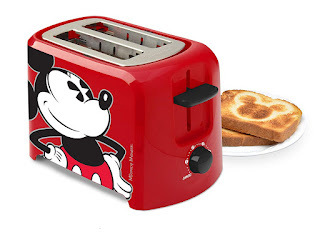 Head over to get this Disney Mickey Mouse 2 Slice Toaster for ONLY $10.61 (Retail $24.99)! Add a pop of color to your kitchen! This colorful two slice Mickey Mouse toaster leaves a Mickey icon imprint on your toast as it browns. It has self-centering bread guides and adjustable browning controls.